New York City will get this new location from the online retailer. 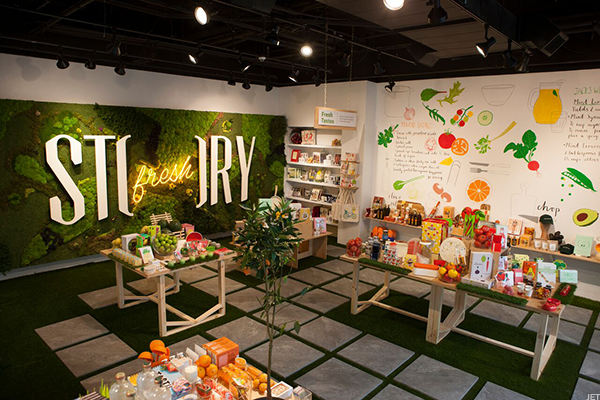 Through a partnership with Walmart's (WMT - Get Report) Jet.com, a concept store called "Story" will open its doors on Wednesday to a temporary location in New York City for Jet to sell fresh groceries. Jet will sell its grocery items - including fresh produce, ingredients and culinary merchandise - at the store for six weeks. Workshops and cooking classes will also be held at the store throughout the display period. The company first launched its online grocery business last May, before it was acquired by Walmart. Jet's 'Story' concept grocery store. "We are thrilled to partner with Story to introduce Jet Fresh and showcase how we are innovating in the space of online grocery shopping and delivery," Sumaiya Balbale, Jet Vice President of Marketing, said in a statement. The move comes as Walmart continues to drive new initiatives to try to crush competitor e-commerce giant Amazon (AMZN - Get Report) in the grocery segment. Amazon recently launched a service for its Prime members that delivers groceries right to their cars, but it's only available in two Seattle locations as the company does not have the store presence to expand on the service significantly, like Walmart does. Because Walmart has a store base of 4,672 in the U.S. alone, the discount retailer was able to ramp up its own shipping offerings in January, adding pickup discounts and free two-day shipping to its services. Walmart bought e-commerce startup Jet for $3.3 billion last August and since then, the subsidiary led by Marc Lore has been eating up smaller online companies to boost its presence and compete with Amazon. Those purchases have included women's vintage-inspired retailer Modcloth.com for $150 million and outdoor recreational retailer Moosejaw for $50 million. Editor's Pick: Originally published May 10.